The dye-sublimation process is fast, its costs have been steadily reduced and it’s popular as a simple and convenient method of producing small and medium-sized colour prints. A thermal process literally heats a thin plastic film impregnated with coloured dye, rendering dots of yellow, magenta and cyan dye from the film onto the paper. Each dye colour is applied in turn, which requires the paper to be over-printed three times. In order to protect the delicate dyes from moisture and physical damage, a clear plastic oversheet is laid down and this also provides a shiny surface finish, which can be compared with conventional glossy prints. Photographically, dye-sub prints can vary quite widely in print quality. The need to print the image over three passes makes the registration of each pass critical in order to produce a sharp, contrasty, image and, as the cost of dye-sub printer hardware has been steadily reduced, some dye-sub printers do a better job than others. Another issue with dye-sub print quality is that black and grey tones are produced entirely from coloured dyes. Achieving neutral tones this way is quite challenging. A dye-sub print has a characteristic quality of its own compared to conventional or inkjet prints. Perhaps more concerning is evidence from independent testing that indicates poor light fastness, or resistance to fading by prolonged exposure to light. But it’s not all bad news for dye-sub printing. Unlike inkjet technology (explained in the next section), there is usually no ambiguity about the cost per print; dye-sub print cartridges usually come with a matching pack of paper. Print quality from dye-sub is also largely free from the graininess that is associated with poor-quality inkjet prints. With their protective top layer, dye-sub prints are admirably impervious to water spillages and other surface damage. Print speed is usually as fast or faster than comparable inkjet printers, though dye-sub printers are often mechanically noisy while in use and more expensive per print. Dye-sub printers earn their place in the market for simplicity and convenience but they aren’t nearly as versatile as inkjet printers. With dye-sub you are often limited to one set size of print, or a small selection of other pre-set sizes. The majority of consumer dye-sub printers produce prints no larger than 6×4 inches. 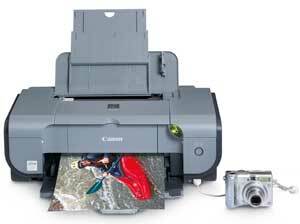 Dye-sub printers aren’t designed to be used with cheap plain paper so you can’t print letters to your bank manager as well as print your holiday snaps using the same hardware. 7. WDC Investigates: Printing - How Many Inks Do You Need? 13. WDC Investigates: Printing - What Size Printer? IntroductionWDC Investigates: Printing - Dye-subWDC Investigates: Printing - InkjetWDC Investigates: Printing - It Is All About DropletsWDC Investigates: Printing - Dyes Versus Pigment InksWDC Investigates: Printing - Print HeadsWDC Investigates: Printing - How Many Inks Do You Need?WDC Investigates: Printing - Cartridge ChoicesWDC Investigates: Printing - InksWDC Investigates: Printing - Independent Photo PapersWDC Investigates: Printing - Colour ManagementWDC Investigates: Printing - Print Quality ProblemsWDC Investigates: Printing - What Size Printer?